Even for an occasional baker, having the best vanilla extract on hand is essential, but it may be getting more difficult to find. Weather and a complicated growing process have made vanilla the second most expensive ingredient in our spice cabinets. Vanilla beans grow on the orchid vine. Vanilla is usually hand pollinated, after which it takes nine months to reach maturity. The beans must go through additional processing, which takes several weeks, before they are ready for use. Theft is also a growing problem. Take the case of 46-year-old farmer Lydia Soa; she has painstakingly stamped thousands of green vanilla pods in her small plantation with her single producer code MK021. In Madagascar, thieves will always be vying for this expensive spice. Sometimes thieves steal her pods but then find out they all have her brand name on them which reveals itself at the local market. Soa stated that stamping her pods allows her to sleep at night, knowing that her pods would still be there in the morning. Many of you who use vanilla may know little about it except that it smells and tastes great -- and sometimes it seems outrageously expensive for such a tiny bottle. Vanillin is the main compound in the best vanilla extract, but it also contains several hundred others which give it a deep, complex flavor. Natural vanilla essence is otherwise known as vanilla extract. The best vanilla extract is an alcohol solution containing vanillin. The extract is usually made by steeping vanilla beans in the solution until the flavor infuses well. 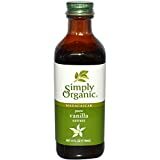 The FDA defines pure vanilla extract as a solution containing 13.35 ounces of vanilla beans per gallon of the solution with at least 35 percent ethyl alcohol by volume. Different types of vanilla beans such as Tahitian vanilla, Mexican vanilla, and Madagascar vanilla are used to make vanilla extract. Flavor of extracts will vary depending upon the variety of the bean used. The Bourbon vanilla beans coming from Madagascar are the most flavorful and sought after vanilla bean in the world. These beans are grown on the Bourbon island of Madagascar and have a rich and creamy flavor with an overwhelmingly buttery, sweet aroma. Mexican vanilla extract has woody notes as well as a spicy taste similar to clove or nutmeg. Alternatively, the Tahitian vanilla has a fruitier flavor than the other two types as well as sweetness with a subtle hint of cherry flavor. Manufacturers even make double or triple strength extracts by adding a higher ratio of vanilla bean to the alcohol solution. Usually, vanilla enthusiasts use vodka to prepare homemade vanilla extracts. Try your hand at making a homemade vanilla extract by submerging split vanilla beans in the alcohol and allowing the mixture to infuse for several months. Preserve vanilla extract for a long time by keeping in a cool, dark environment or in a dark bottle that does not allow much light to pass through it. 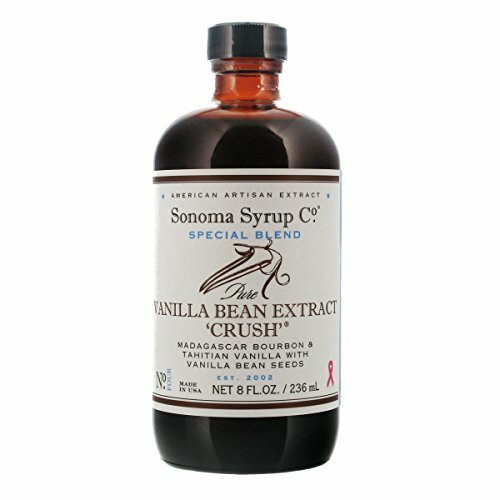 How vanilla is processed from bean to extract? When the vanilla bean comes to the manufacturing plant, the bean experts inspect it and then release the beans for production. Next, they are grouped into batches before they progress to the milling machine which splits the beans. Then the divided beans are loaded into stainless steel extracting tanks. Alcohol and water get circulated over the beans. Finally, the finished vanilla gets filtered into the holding tanks to await bottling. The manufacturers use a cold extraction process because the essential oils are responsible for the flavor. Using heat will cause flavor loss. Following extraction, another three to four weeks is required to progress to the bottling stage. Take care to store any form of vanilla at room temperature away from sunlight and heat. What are the uses of vanilla extract? Vanilla adds a rich flavor to your sweet and savory dishes alike. Try using it in your pancake recipe, marinades, salad dressings, dessert sauces, and custards. Vanilla extract can also be used to freshen up your fridge, deodorize your microwave, neutralize the smell of fresh paint, as perfume, and to relieve minor burns. Similarly, vanilla is a potent skin saver, containing antioxidants that help to soothe irritated skin. There are rumors that vanilla is also an effective natural pest deterrent because mosquitoes can’t stand the smell, but we aren't going to test that claim. Where can you buy the best vanilla extract? High-quality vanilla extract is available online at sites such as Amazon, Walmart, and eBay. Also, it is available in supermarkets and hypermarkets near your area and several gourmet shops around the country. To bring you the best vanilla extract brands in the market we conducted a lot of research. Choosing the best vanilla extract was a tough call. We highlighted vanilla extracts prepared from premium beans, containing more beans than required by law, made with just a little sugar and adequately aged. Likewise, we also took into consideration customer reviews and the longstanding reputation of the brands in the market. Vanilla has become pricey, but if you’re a baker having a bottle of the best vanilla extract in your pantry is a must despite its high price. Everyone loves treats that are rich in the flavor of vanilla. Sourced from premium hand-selected beans, this vanilla extract enhances the flavor of your baked goods. It is USDA approved and Fair Trade Certified. 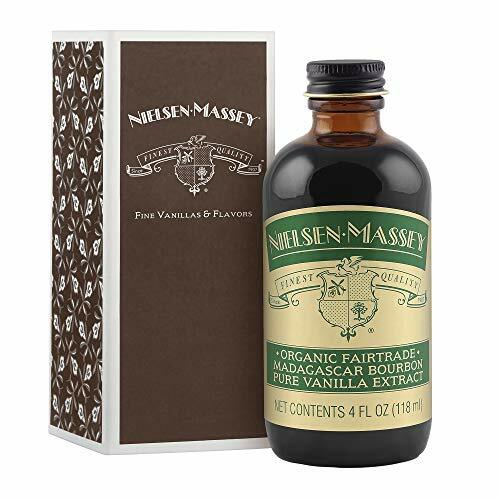 Nielsen-Massey has been creating the finest vanilla extract products since 1907 which speaks for its quality. The manufacturer uses a proprietary cold extraction process which preserves more than 250 flavor ingredients. This product is Kosher and gluten-free certified, all-natural, allergen-free, and GMO-free. People love this product. A satisfied Amazon customer states it's the best out there when it comes to vanilla extract. This extract receives a 5.0 out of 5 star Amazon rating and is a bit pricey. It costs between $$$ to $$$ for the 32-ounce size bottle but is worth every penny. Made from the richest vanilla beans from Mexico the Blue Cattle Truck Mexican Vanilla extract is all natural, gluten-free, and contains no additives or preservatives. This product comes from single-sourced vanilla beans. It contains vanilla bean extract in purified water with 10 percent alcohol and natural vanillin. Mexico imports these vanilla beans, and bottles the extract in the US. The reviewers say that this product has an intense flavor and mingles well with their recipe. Comparatively the customers feel that Nielson & Massey gives a much more subtle flavor to the recipe and is even more refined and rich. On the positive side, the intense flavor of the Blue Cattle Truck vanilla gives an extra punch to everything she cooks comments an Amazon customer. This product receives a 4.5 out of 5 star Amazon rating, and the price range is pocket-friendly. It costs between $$ to $$ for the 16.7-ounce bottle. Made from the finest quality premium Tahitian and Madagascar Bourbon vanilla beans this product gives you a delicate and subtle vanilla flavor. Cultivated on the plantations in the South Pacific and Bourbon islands, the company carefully cures vine ripened beans and then ships them to California. The extract contains both the Tahitian and Bourbon vanilla bean extracts in purified water along with 40 percent alcohol. One reviewer states that she made a vanilla cheesecake using this product and that the flavor is outstanding. She then wondered if there was a way to give ten stars. This product scores a 5.0 out of 5 star rating and costs between $$ to $$ for an 8-ounce bottle. That’s a decent price to pay for such a high-quality product. 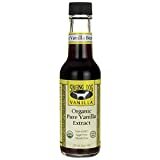 Bring a great depth of flavor to your baking and cooking with this vanilla extract which contains flavor mix vanillin as the main ingredient. The delicate flavor of this pure vanilla stays on even at high baking temperatures. This product is best for those who want to eliminate alcohol and gluten from their favorite recipes without compromising on the flavor. The ingredients that go into this OliveNation's vanilla extract includes vanilla bean extracts, glycerin, natural vanillin, xanthan gum, sugar, and water. 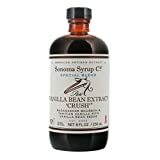 Amazon customers give it a 5.0 out of 5 star rating, and the price range of this vanilla extract falls between $ to $$ for a 2-ounce bottle. 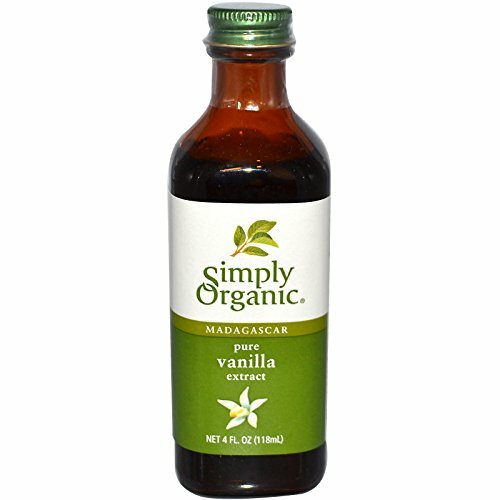 This 16-ounce pure vanilla extract is all natural, with no salt or sugar added. 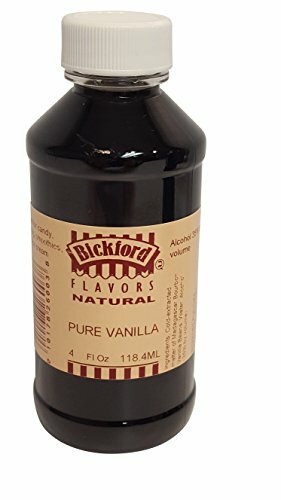 Bickford Flavors Pure Vanilla extract consists of Madagascar bourbon vanilla and 35 percent alcohol. It's the first flavor the Bickford family brought to market in 1917, this vanilla extract continues to pass the test of time with flying colors. The price of this 16-ounce vanilla extract ranges from $$ to $$. Though this product is yet to receive reviews and a rating on Amazon we've included it in our best of the best list because it is all natural, Kosher, and has no added sugar or salt. 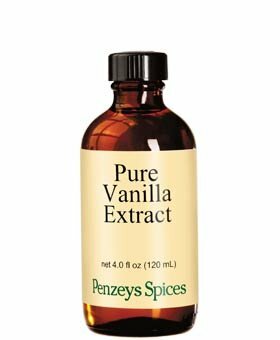 Pure vanilla extract by Penzeys Spices contains the extract from premium quality Madagascar Bourbon island vanilla beans. These beans have a rich, complex and smooth flavor. The cool-perking process preserves the vanilla bean’s 400 flavor-enhancing components that ultimately protects the full bean flavor. One customer feels that Penzys Spices are the best in the world. Not only does this vanilla extract grab Amazon’s Choice banner but also scores a decent 4.5 star out of 5 star rating. The price range falls between $$ to $$ for the 4-ounce size. Singing Dog's vanilla extract is sugar-free and has a wonderfully rich flavor. The unique aging process gives this extract a smooth, mellow consistency with a rich aroma. This product is organic, non-GMO and gluten-free. An Amazon customer describes this extract as an excellent tasting vanilla that gives a rich taste to anything that she makes. A 5-ounce bottle costs between $$ to $$ and receives a 4.9 star out of 5 star rating. Sourced from the finest ingredients from all over the world Watkins has been a beloved mainstay in American kitchens for over 100 years. This vanilla extract has the stamp of Watkins, and it is gluten-free and contains no artificial colors. The 11-ounce bottle delivers a concentrated flavor that guarantees superior results. 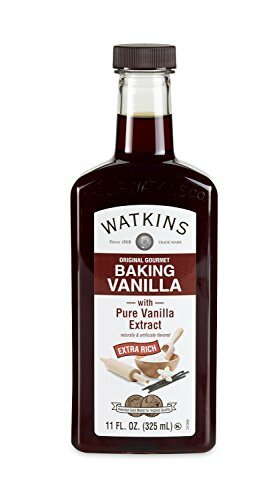 No list of the best vanilla extract would be complete without the inclusion of Watkins. A reviewer states that she likes the strength of the product and marvels at its superb taste. The Watkins Original gourmet vanilla extract bags the Amazon’s Choice banner and gets a 3.5 star out of 5 star rating. The extract cost ranges from $ to $$. This product has a deep rich taste and color due to the highest grade beans. The vanilla beans undergo batch blending for consistent flavor in every bottle. 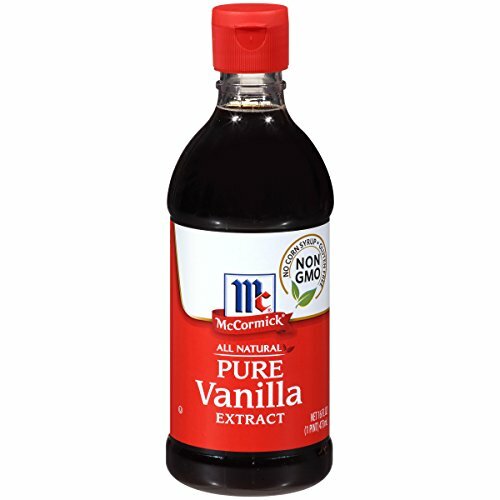 McCormick pure vanilla extract is non-GMO, gluten-free and does not contain corn syrup. It is certified Kosher by the Orthodox Union. An Amazon reviewer proudly declares that her mother and even her grandmother were using this extract. She feels this extract is simply the best in the market. But some customers complain that this extract is much more diluted than other regular vanilla extracts. This vanilla extract scores a 4.4 out of 5 star rating on Amazon and costs between $$ to $$. Made from the highest quality Bourbon Madagascar vanilla beans this extract enjoys an extra rich and creamy consistency. This product is certified organic, is free of GMOs and gluten and sells in a pack of two 4-ounce bottles at a price range between $$ and $$. An Amazon customer writes the scent is perfect and natural, not artificial smelling. Furthermore, she uses the extract for a myriad of foods from ice cream to pound cake. This vanilla extract receives a 4.0 out of 5 star rating on Amazon. After carefully considering all of these products, we believe Nielsen-Massey Organic Madagascar Bourbon Vanilla Extract is the best vanilla extract in the market. Though the other brands offer superb flavor enhancing qualities, this product surpasses them all. Small-scale farmers in Madagascar grow the vanilla bean using sustainable farming practices. These farming practices go a step further to protect against soil erosion and deforestation. Moreover, the unique cold extraction process preserves some 250 flavor compounds. This process results in an extract that’s full, creamy, sweet and mellow with velvety after-tones. Additionally, this product is Kosher and gluten-free certified, allergen-free, GMO-free and all natural. Though it’s a bit pricey, it’s worth it. Do you have any great recipes you want to share? What is the best vanilla extract you have used? Please let us know in the comments section.